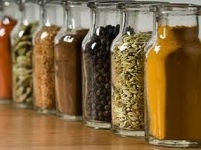 Enjoy my top 10 list of herbs and spices for freezer cooking and how I like to use them. Paprika is principally used to season and color rice, stews, and soups, such as goulash and in the preparation of sausages as an ingredient that is mixed with meats and other spices. It is often smoked to draw additional flavors. In Spain, paprika is known as pimentón, and is quite different in taste; pimentón has a distinct, smoky flavor and aroma, and is a key ingredient in several sausage products, such as chorizo or sobrasada, as well as much Spanish cooking. Sweet and pungent. Great in baked goods, but also adds a warm note to savory dishes. Nutmeg is a tasty addition to cheese sauces and is best grated fresh. Nutmeg is a traditional ingredient in mulled cider, mulled wine, and eggnog. Oregano is an important culinary herb. It is particularly widely used in Greek, Spanish and in Italian cuisine. It is the leaves that are used in cooking, and the dried herb is often more flavorful than the fresh. Oregano is often used in tomato sauces, fried vegetables, and grilled meat. Together with basil, it contributes much to the distinctive character of many Italian dishes. Oregano combines nicely with pickled olives, capers, and lovage leaves. Unlike most Italian herbs, oregano works with hot and spicy food, which is popular in southern Italy. Oregano is an indispensable ingredient in Greek cuisine. Oregano adds flavor to Greek salad and is usually added to the lemon-olive oil sauce that accompanies many fish or meat barbecues and some casseroles. The dish most commonly associated with oregano is pizza. Its variations have probably been eaten in Southern Italy for centuries. Oregano became popular in the US when returning WWII soldiers brought back with them a taste for the “pizza herb. The fresh and dried leaves are used frequently in traditional Mediterranean cuisine; they have a bitter, astringent taste, which complements a wide variety of foods. When burned they give off a distinct mustard smell, as well as a smell similar to that of burning which can be used to flavor foods while barbecuing. Rosemary is extremely high in iron, calcium, and Vitamin B6. Avoid consuming large quantities of rosemary if pregnant or breastfeeding. Delicious in lamb dishes, in soups, stews and to sprinkle on beef before roasting. The seeds and membranes are the hottest parts of a chili. The amount of heat in chili flakes depends on the variety of chili pepper and where it was grown. Crushed dried red chilies can be added to or sprinkled over all kinds of dishes. You can easily make your own by drying fresh red chilies on a radiator and then crumbling them with your fingers. To preserve full flavor, always store in the refrigerator. For a spicy oil, combine 1-2 tablespoons of chili flakes with a cup of your favorite vegetable oil. Lightly simmer for about 10 minutes, allow to cool completely, then strain. Stored in the refrigerator, this oil will keep for about 6 months and can be used in salad dressings, marinades and to spice up your favorite sauté. It is commonly used in cakes and other baked goods, milk and rice puddings, chocolate dishes and fruit desserts, particularly apples and pears. It is common in many Middle Eastern and North African dishes and in flavoring lamb. It is used in curries and pilaus and in garam masala. It may be used to spice mulled wines, creams and syrups. The largest importer of Sri Lankan cinnamon is Mexico, where it is drunk with coffee and chocolate and brewed as a tea. This warm spice is available in sticks and ground into powder, and has many uses. Cinnamon is also reported to be useful in regulating blood-sugar levels in diabetics. Sweet Italian Basil – Highly aromatic with a robust licorice flavor. Excellent in pestos, as a finishing touch on pasta dishes, or stuffed into sandwiches. Thai Basil – A spicy, edgier cousin to sweet Italian basil. A must-have for Thai stir-fries, Vietnamese pho, spring rolls, and other South Asian dishes. Since the oils in basil are highly volatile, it is best to add the herb near the end of the cooking process, so it will retain its maximum essence and flavor. Salt can be used in moderation to add flavor and to bring out the taste of other foods. It also acts as a preservative when it is used in pickling and chutney-making, or when curing meats and fish since it draws out the moisture and prevents decomposition. Table salt can be purchased with or without iodine. Sea salt has a slightly stronger taste than table salt. Pepper is the world’s most popular spice; a berry grown in grapelike clusters on the pepper plant. The berry is processed to produce three basic types: black, white, and green. Black is the strongest (slightly hot with a hint of sweetness) flavor of the three. White peppercorn is less pungent. Black and white are available whole, cracked, and ground. Green peppercorns are packed in brine and are available in jars and cans. Whole peppercorns freshly ground with a pepper mill deliver more flavor than pre-ground. Goes well with cheese, eggs, fish, game, lamb, pork, poultry, salad, sausages, soup, steaks, strawberries, tomatoes, veal. Fresh, dried and powdered garlic are available in markets throughout the year. Garlic is arranged in a head, called the “bulb,” averaging about 2 inches in height and diameter consisting of numerous small separate cloves. Both the cloves and the entire bulb are encased in paper-like sheathes that can be white, off-white or pinkish. Although garlic cloves have a firm texture, they can be easily cut or crushed. The taste of garlic is like no other-it hits the palate with a hot pungency that is shadowed by a very subtle background sweetness. While elephant garlic has larger cloves, it is more closely related to the leek and therefore does not offer the full health benefits of regular garlic. Mild and aromatic, the first of the new season’s garlic can be eaten raw in dips or marinades, or blanched and roasted for a creamy accompaniment to roast chicken.